I have to tell you, when I made this bread, I had no idea what I was getting into. When I went to Boma, I didn’t go for breakfast, I was there for dinner and was far to distracted by all the other items on the buffet to see if there was banana bread! That being said, I decided to give this recipe a try, and I loved it! Now, the original recipe has no spices. I happen to like my banana bread with spices in it, so I always add cinnamon, nutmeg, and allspice. You can do the same, or make it plain. I’ve done it both ways, and no matter what, its delicious! This is a really easy recipe to make. Just preheat your oven to 350 degrees and get out your ingredients. It doesn’t take much time to get together at all! The biggest thing is to make sure that your butter is softened, because hard butter doesn’t mix well. Believe me, I’ve tried because I can be so impatient when I want to make cookies. The other problem you might have when reading through the ingredients is the buttermilk. You do NOT need to run out and buy some just for this. If you don’t have it on hand (I never do), the ratio to “fake it” is 1 tsp of vinegar to 1 cup of milk. So when you are pulling everything out, just measure out your 1/2 cup of milk, and add 1/2 tsp of vinegar to it. Stir it in and let it sit while you get the butter, sugar, and eggs going. Then it will be fine to dump in with everything else. I’ve never noticed much difference doing it this way, so don’t worry! Once you have the first three ingredients combined, go ahead and add the rest. There is no fancy order to this. Just measure it all in and let the mixer do its thing! Once its all combined, you want to pour it into two greased and floured loaf pans. I tend to grease and flour, mainly because I’m paranoid that it won’t come out otherwise. It never hurts, right? In my experience, banana bread will stick if it isn’t floured. Just pop it in your oven, and let it bake for 45-50 minutes. You’ll know its done when a toothpick or cake tester comes out clean. These loaves won’t be huge – they’ll be pretty flat on top. Doesn’t matter. They still taste delicious! The temptation here will be to get it out of the pan and eat it hot. Don’t do it. First, whenever I’ve tried to get banana bread out of a pan just out of the oven, it always gets stuck and comes out in pieces. Second, it actually will taste better lukewarm/room temperature. I’m actually one of those and thinks banana bread tastes better the next day. 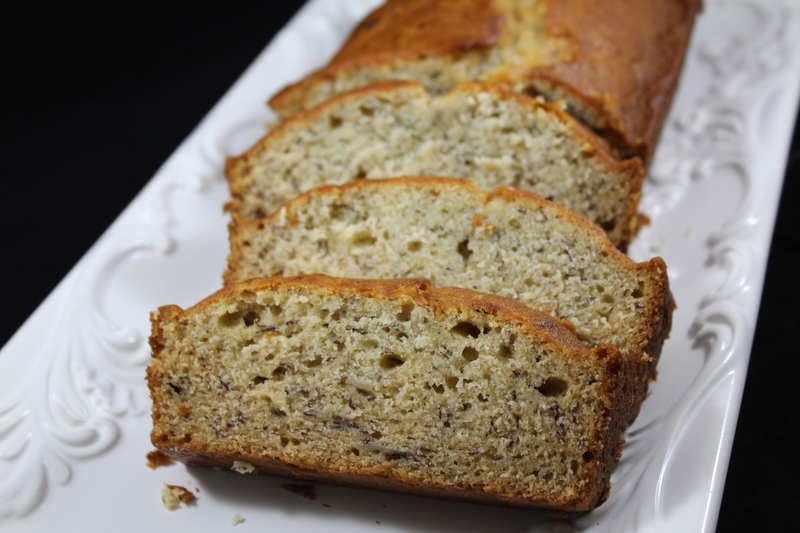 Best part of banana bread? It works as breakfast, snack, and dessert! Preheat the oven to 350 degrees, and grease and flour two loaf pans. Cream butter, sugar, and eggs together. Add in remaining ingredients and beat until combined. Pour into the prepared loaf pans and bake for 45-50 minutes. You'll want to let this cool before eating, and I find its almost better the next day.